The Disney Den: Celebrating Animal Kingdom's 15th! This past Earth Day (Monday), Sara and I decided to go to Animal Kingdom's 15th anniversary! It was loads of fun, and I'm happy I got to celebrate one of the park's major anniversaries, since they don't happen very often! Right as we walked into the park, we grabbed our 15th anniversary pins and special edition maps they were giving away for free at the entrance. They're pretty snazzy! Unfortunately we didn't get any other 15th anniversary merch, because the line into the store was nearly two hours long! So instead, we decided to start the day with a trip down the Pengani Forest Trail because Sara and her coworkers knew someone who was doing a Professional Internship and working on the trail. We saw adorable birds, giant hippos, playful monkeys, and an adorable mother gorilla watching over her sleeping baby! Momma gorilla watching over her baby! When we exited the trail, we saw our roommate Sarah working the fast pass lane at Kilimanjaro Safaris, who let us through the fast pass lane because it was pretty slow and there wasn't a long line. One thing I love about the Safari is that no trip is ever the same! It's always so much fun to see all of the animals, especially the giraffes, elephants, rhinos, and lions! After the safari we went on Everest once, and then watched Finding Nemo: The Musical for the first time! I think it's super cute, but I don't know if I really care for it all that much. The songs are pretty catchy, but it's kind of weird to see the puppeteers...and the fact that it wasn't originally a musical is a something I had to adjust to. The puppets are beautiful though! Plus, the woman who voiced Dory did an awesome job. Sara was getting hungry so we decided to eat lunch at Pizzafari, where they were coincidentally having cookie decorating in honor of DAK's anniversary! It was super adorable. They gave us butterfly shaped sugar cookies with three different colored frostings and sprinkles! We made such a mess! 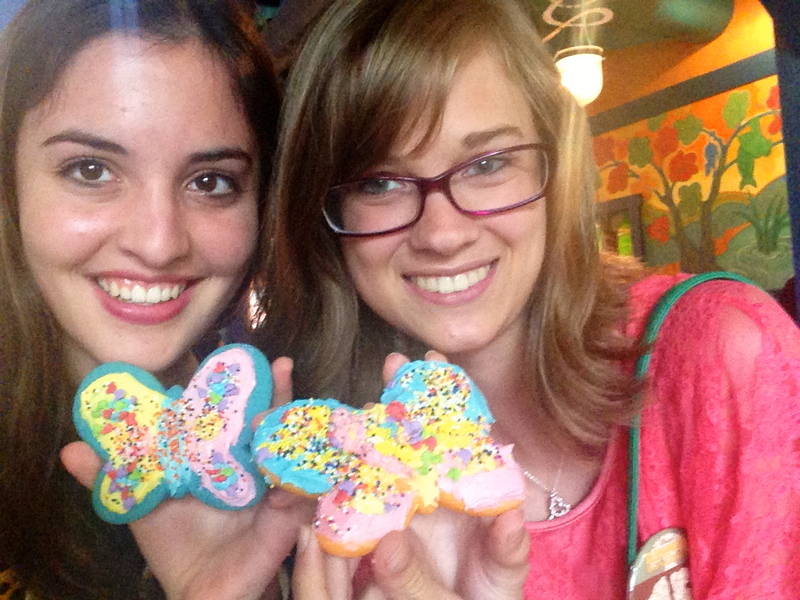 We ate our deliciously colorful cookies and decided it was time to return to Everest! We ended up going on the ride ten times! New record! No matter how many times I go on that ride, the part that takes you backwards will always be so much fun! Our pictures were priceless, and I wish my phone could take better quality photos for that ride. Such a fun day in DAK! When we got off of Everest for our tenth and final round, we discovered in a few minutes the park was going to close...so what did we do? Run over to Dinosaur, of course! Much like most of the afternoon, there was basically no one there! We sat down during the introduction video (we've seen it so many times already) and the cast members even though it was funny because guests were following suit and sitting down with us. A lot of people also loved our picture, which we of course went over the top for in order to look ridiculous. One man who went on the ride by himself in our car even wanted to buy the photo! Overall it was probably the best day I've had in Animal Kingdom since I've been doing this program. Sara and I ended the night with watching Something Borrowed (one of our favorites) back in our apartment before I had to head to bed for an early morning shift the next day. Awesome! It sounds like you had a lot of fun! Haha I love the Dinosaurs picture!